Library users–Effect of technological innovations on. Librarians–Effect of technological innovations on. 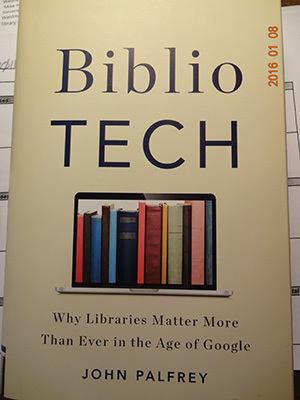 Here’s another book by a non-librarian telling us how valuable librarians and libraries are if they’d just change what they are doing. There is no denial that technology is changing the world. Where it used to be changing computers every 5 years was a necessity, it is now every 3 years or even sooner. How things are being done now will probably be different in another 5 or even 10 years. Library science has been one of the hardest hit professions by technology. The reality is that librarians have been doing lots with nothing for decades. Since I started in the library field as a page in the 1980s, I’ve watched positions be eliminated; job titles are merged with people with other jobs, so that for every two or three positions eliminated, maybe one would be created. Now the jobs that are created did not even exist five years ago. All over the country, colleges and universes are being corporatized; what doesn’t make money is not important. And here is where libraries find themselves, like others in the non-profit sector: what functions libraries perform does not make money. Libraries are not self-sustaining and only take tax money to provide services to everyone in the community. This is the idea behind libraries. In the corporate view, providing services with no remuneration makes no sense. Palfrey mentions the Digital Public Library (DPLA) and how the digitization of so many image and written works has caused some people to fear that libraries truly will disappear because the support for them will erode when faced with the DPLA (p. 103-105). What Palfrey is saying is that libraries will not disappear, but that they must start cooperating more than ever and evolve into platforms that will make them even more indispensable. And this is his whole argument: libraries must change to not only survive but thrive and fill a necessary niche in the future. Librarians know that the printed book will not remain the be-all and end-all of libraries. That idea went out two decades ago. Just what, exactly, the library of the future will be is the big question. Palfrey does make the case for the librarian as helpful researcher for patrons in the future. What Palfrey is arguing isn’t bad, but how do we “reinvent” libraries? Who will do it? The administrators who have no idea what the value of libraries are, or people who truly value what libraries have to offer? He offers ten points to redefine libraries (p. 226-228), which are food for thought. This book has certainly got me thinking.